Combining Greek with the English Standard Version text, the Greek-English New Testament is an essential resource for students, pastors, and scholars who work with the Greek New Testament. On each spread, one page displays the Nestle-Alland Greek text, 28th edition, while the adjacent page contains the corresponding ESV text. Simply formatted and easy to use, the Greek-English New Testament will be an invaluable resource for anyone studying and working from the New Testament in its original language. 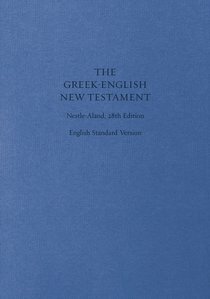 About "ESV Greek English New Testament Nestle-Aland 28Th Edition"
Customer Reviews For "ESV Greek English New Testament Nestle-Aland 28Th Edition"
For those with a proficient knowledge of Biblical Greek, and looking to study the most up-to-date version of the German Bible Society's Greek New Testament alongside the essentially-literal ESV, this is exactly what you're looking for! The NA28 is the most well regarded scholarly Greek text, and it's usually hard to find a hard copy for less than 100. Having the Greek text on one page and English on the opposite provides a much clearer way of reading each text on its own while still being able to easily compare and study both together. An interlinear version is also produced for those who would rather the two texts combined, but for many purposes this layout is preferable. The 'Greek-English New Testament' is jointly published by the German Bible Society and Crossway, and represents outstanding value for money. An inexpensive diglot New Testament it presents, on facing pages, the standard critical Greek text (the very recent 28th edition of Nestle-Aland) alongside the 2011 update to the English Standard Version. It includes the English introduction, the complete text-critical apparatus, and the four appendices of the standard German Bible Society editions of NA28 (the German introduction, the four maps, and the removable English  German 'Witnesses, Signs, Abbreviations' tracts are not); and the regular preface and 'Explanation of Features in this edition' of the ESV, along with occasional (albeit redundant) footnoted references. A word to the wise: this is NOT an interlinear, neither is it a "Reader's Edition" of a Greek New Testament. So you won't find any parsing information, vocabulary helps, or Greek-English lexica printed in this volume; it won't be of any use to people unfamiliar with Greek, and a working knowledge of the principles of New Testament textual criticism. For those with the necessary skills, however, this is doubtless the BEST value edition of NA28 in print. At around 30 dollars it's 120 dollars less than the equivalent sized German Bible Society edition, and includes the ESV text to boot. I believe it warrants a place on the study desk.